Iowa’s two U.S. 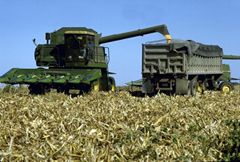 Senators parted ways in Tuesday’s approval of a new five-year Farm Bill. Joni Ernst voted in favor of the compromise bill, which now goes to the House. Chuck Grassley was one of just 13 Republicans voting against the bill. “It’s the small and medium-sized farmers that needs the help from the government. Not these big, big farmers and corporate farmers that we’re going to end up helping the way this bill is written,” Grassley, a farmer from New Hartford, said on the floor of the Senate. Grassley’s payment limitation amendment was removed from the Farm Bill in conference committee. He’s fought for years to place “hard caps” on subsidies from the government, saying the largest ag operations and even non-farmers are benefiting the most. “I’m more than just a little disappointed,” Grassley said. “Especially when the impact of large farmers being allowed to manipulate the system is that young and beginning farmers face even larger hurdles.” Grassley said farm policy should be “a limited safety net” to help farmers recover from natural disasters and other “unforeseen challenges.” This bill, he said, goes well beyond that. “Today, we have a Farm Bill that is intentionally written – and I want to emphasize intentionally written – to help the largest farmers receive unlimited subsidies from the federal government,” Grassley said. Senator Joni Ernst served on the conference committee that drafted the compromise. In a prepared statement, she praised the bill as “farmer-focused” and said it includes her provisions to reform the Conservation Reserve Program and provide “critical mental health support” through the FARMERS FIRST Act.